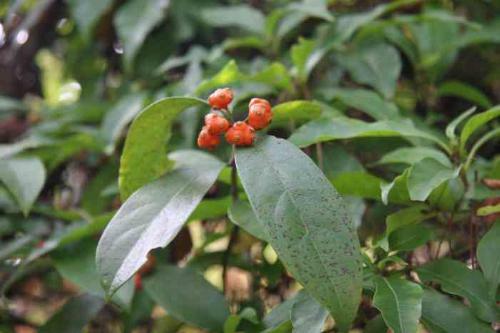 The drug is the dried or fresh root or entire plant of Morinda parvifolia Benth. (family Rubiaceae), growing in hilly scrubs, and distributed in South China, Southeast China. Sweet, cool; lung meridian entered. It is used to remove damp-heat, resolve sputum, relieve cough, dissipate blood stasis and alleviate pain; for the treatment of cough due to influenza or commom cold, bronchitis, pertussis, dyspepsia, diarrhea, traumatic injury, muscular strain of the lumbar region, etc.